So I'm quite the anglo-phile (among my many "philes"/obsessions). 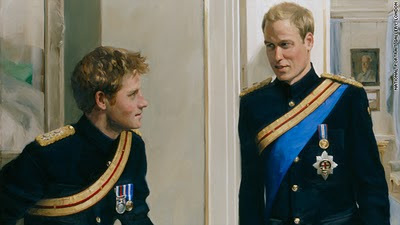 This is a great new portrait of those two great Princes William and Harry by artist Nicky Philipps. The portrait is now a part of the collection at the National Portrait Gallery. Their mother should be proud! Handsome dudes, aren't they! NOW this is funny....way to go Conan!